This is a charming, clean, updated condo in the perfect location for any vacation! No need to drive to Sea Street Beach and Keyes Beach which are a 5 minute walk away. Stroll down to Main Street for breakfast, shopping, a casual or fancy dinner, or even just an ice cream! The condo is tastefully furnished and has 2 bedrooms upstairs, one with a queen bed and half bathroom. The other large bedroom has a queen bed plus 2 twin beds, and a pack n play - ideal for families! Both have closets and plenty of room for storage. Downstairs the kitchen has a table with 6 chairs and is fully stocked. The downstairs bathroom has a tub/shower and a washer and dryer. The living room has a 42" Smart TV with cable and WiFi, and has access to the deck. Relax on the deck with a book on the chaise lounge or grill (gas grill) and enjoy a meal at the patio table and 4 chairs. There are two reserved parking places right in front of the condo, no driveways to deal with. If you don't mind jumping in the car for a 3-5 minute ride, you can enjoy Kalmus Beach which has a great concession stand and bathrooms, and Veteran's Beach with a big playground for kids and picnic area and a walk to the JFK memorial. Right along Ocean Ave you can catch a ferry to the islands or a fishing or tour boats. A landlord beach pass is provided, so you pay nothing to drive and park at any beach or lake in Barnstable County. Everything you need for spending time at the beach is provided, including beach towels, beach chairs, beach umbrella and beach carts. Just bring yourself! Bath towels and linens also included. We are retirees from Connecticut who love Cape Cod. I wanted a place to be close to my grandchildren who live on the Cape, to have family and friends stay when they're visiting. I rented this property for 2 weeks every summer for 5 years, and fell in love with it. When the owner decided to sell, I jumped at the chance. My husband and I totally enjoy being able to walk to the beach, and walk to Main St. Hyannis for breakfast when we're here. The mall and shops are minutes away, or we can sit on the deck and read. We love to take the grandkids to Main St. for carousel rides, the arcade, and of course, ice cream. This condo is great and also unique, with the front porch and back yard deck. There is plenty of room to eat at the dining table or sit around watching TV. The 2nd bedroom is large enough for a family of 5 to sleep in comfort (1 queen, 2 twins, 1 pakNplay). The main feature, though, is the location. We provide a beach pass so guests can drive 3-5 minutes to other beaches and ponds in Barnstable. Hyannis is the center of Cape Cod, where you can drive anywhere from Provincetown to Falmouth. The ferries, tourboats, fishing boats, buses, trains, etc. all leave from Hyannis. Hyannis Center has so many great restaurants and stores, too numerous to mention and Melody Tent is up the street. There is always a festival, car show, performance or craft fair taking place on Main Street during the summers. Main level full bath (tub with shower) includes all towels. Washer/Dryer conveniently located here. Brand-new split ductless AC/heat unit downstairs. Window AC units in each bedroom. Split ductless heat unit in living room in addition to Rinnai gas heater. Separate electric heat units in bedrooms. All bath, washcloth, and hand towels Including beach towels provided. Fully equipped with blender, coffee pot, toaster and toaster oven. Large armoire which stores the small appliances, etc. along with games and puzzles for families to enjoy. Summer reading novels for anyone to enjoy. Lovely property in a perfect location. Wonderful accomodation and a great vacation overall. Needs a little maintenance some areas are really run down. Condo is well stocked with everything you would need but had a problem with ants in kitchen, dinning room and living room. It was clean but had a musty or dot and carpet was dirty. I'm sorry you were not completely happy with my property during your recent stay. If you had contacted me about the ants I would have responded immediately! The carpet is clean, but worn and will be replaced next Spring with tile or laminate along with the kitchen flooring. I truly want my renters to have a positive experience and I thank you for your feedback. This was the best place my wife and I have ever stayed at on Cape Cod. There was plenty of room for a large family. This place was clean, well stocked with everything you would need, even a gas grill outside. It was a quick walk to the beach, no need to drive your car. We will definitely be returning next year. Immaculately clean with everything you could wish for. My Wife & I stayed over 4th July, 2018 after flying in from England . Great location, 20 mins walk to Hi-Speed ferries & Main street. Don't bother paying for ferry parking, walk. Large rooms, air con worked well.Plenty of beach chairs & towels. Local shop stays open late, with good range of products. Plenty of good restaurants on Main Street. Only possible downside is 1 shower might cause a morning queue if fully occupied. Great condo to stay at !!! We loved staying at the condo . 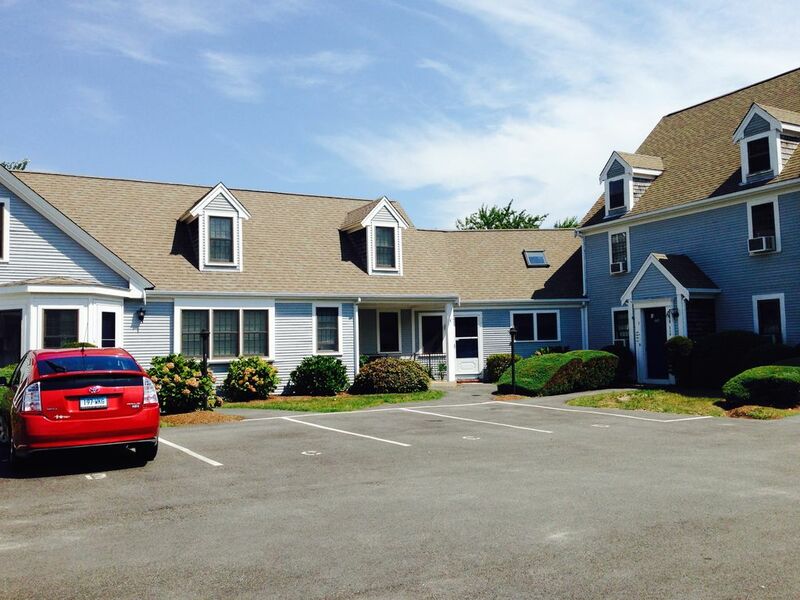 It was very clean and extremely comfortable and close to everything in Hyannis ! I would highly recommend staying here ! !